It is easy and, compared to other North American cities, relatively cheap to live in Montreal. Since McGill campus is right downtown, you want and can live in the downtown area. Montreal is unique because people live in, work in and enjoy downtown which is safe and lively all the time - at 1pm or 1am. 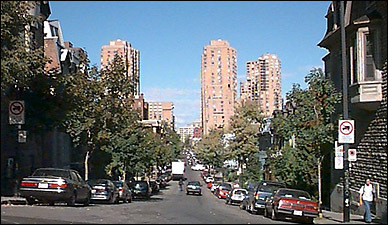 On one side of McGill Campus is the "student ghetto" (above) - comfortable and affordable living right downtown. Some students rent small apartments individually, sometimes sharing charming big ones. McGill student residences are also located next to the main Campus.